I'm happy to have chosen Perles d’Avenir Nursery for Antoine! I am very satisfied and convinced that my son now has a good background for school! As expatriates, it is always difficult to find the right education for our children and also a good nursery. But we were lucky to have Perles d’Avenir where Antoine discovered and learned fulfillment, sharing, respect for others, friendship, and good French! Thank you for all and good luck in your future projects !!! I can obviously touch how much you are working on modifying the nursery with all the new developmental method as I can notice the change to the best since my first child who was in the nursery 2012. Thanks a lot! 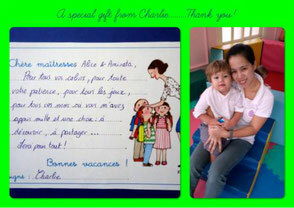 We will keep a very good memory of Perles d’Avenir Nursery and years spent in Doha. approach, adapted and warm at the same time. My greetings to Gwenaelle and Olfa we will not forget them. We will miss Perles d’Avenir ! I wanted to wish you a very happy new year 2018 with a lot of happiness and travel. Keep your good mood and your smile for 2018. Maysa and I will keep beautiful memories of the nursery and your attention and the great work of teams! See you soon! Anton always says such nice things about his school, and I know he loved every day there. Thank you for making our time so special and all the care you took of Anton. We had a very great time this late morning with the children, delighted and amazed, with your accompaniment. We wish my husband and I to thank you for this very beautiful initiative rich in imagination and creativity once again demonstrating the talents of your teams. Every day marks a pleasant memory at Perles d'Avenir, I mean, pick up a baby bloomed at the end of the day. Thank you for your efforts! The photos are AMAZING! :) Truly a wonderful experience for both my daughters, filled with so many creative activities and learning opportunities! Thank you and please tell both their class teams THANK YOU! Thank you very much for a lovely day!! It really was one of the best days I had with my daughter Malak! It was so exciting to be a part of her day and see how she is at the nursery! It truly is an incredible team! I am happier than ever that Malak is part of this great nursery and learning experience! remember it! Please continue to plan these great activities and events!!! Special thanks to Sylvie :) she is truly amazing! And her team Aminata, Katrina, and Alice!! They have all become like family to Malak! Dear all, From the bottom of my heart I would like to thank you for organizing this special event. Timothy and myself had an amazing time. I would like to thank you for this great year that Kate has spent in your nursery, the team that surrounded and accompanied her was really exceptional. Thanks for all the love that the team has surrounded with Kate, we will keep wonderful memories. Clara started a kindergarten class. Today was her 2nd day. Everything is going well. From the first day she made new friends. Her teacher was very surprised and I was very proud. 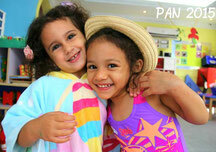 I am aware that this is come from all the teaching and love brought by PAN. Thank you once again for having taking so care of Clara, for allowing her to flourish and for being what she is today, a funny, touching and surprising little girl. Wishing you all the success of the world, and maybe see you soon. Our best memory at Perles d’Avenir are the stories my daughter tells me in the car when she comes home from the nursery, knowing that she is so happy and fulfilled is the most enjoyable for me. I will keep a lot of good memories of Perles d’Avenir. But the most enjoyable for me was especially the family day, when I saw Lucas sang it makes deeply touched me. We loved our child's enthusiasm every day on arrival at the nursery. During the 2 years that Eleonore spent at Perles d'Avenir, I saw her blossom and learn a lot. and teacher every morning! And to find her at 2.30 pm saying "today, I had fun at the nursery!" A big thank you for the quality of all the organized activities and the kindness of the whole team! All the best! It's been 7 months now, a little story that started, a confidence that was built slowly step by step. "Perles d’Avenir" is not a nursery, it is our partner to build the most dear person to our heart. "Perles d’Avenir" 'is not a nursery, it is a wonderful world, understanding and enriching for the "Pearls" as for their parents. Thank you. Thank you so much for another wonderful year at Perles d'Avenir. Penny has had an amazing year and loved every minute of her time here. I would like to especially thank all the staff who looked after Penny's class this year. It's been an amazing year of growth and development and all of it has been conducted through fun! We look forward to coming back in September and seeing you all then. Thank you very much to my lovely teacher Latiffa for all these months learning and playing together😊. I 'll miss you a lot !!! 😉. every day with these little pearls. evolve ... the first steps for some like Eric and Gaby, the first words for others like Mimi and Ella through the big laughs of our youngest like Nardjess and Rawan. Our days are punctuated by their joy of communication, their pleasure of discovery and experience: Our smiles every morning to welcome them and make the link with the parents to begin at best the new adventures of the day; Our arms to reassure them in moments of sorrow; Our patience and our energy to help them grow. A special gift from Charlie ... Thank you!